Burford Books. Hardcover. B005WEY3XO Meets the good condition guidelines. Has torn dust jacket. Has wear. Five star seller - Buy with confidence! . Good. 1993-09-06. New. Ships with Tracking Number! INTERNATIONAL WORLDWIDE Shipping available. Buy with confidence, excellent customer service! 2005-06-01. New. Ships with Tracking Number! INTERNATIONAL WORLDWIDE Shipping available. Buy with confidence, excellent customer service! 2003-05-05. New. Ships with Tracking Number! INTERNATIONAL WORLDWIDE Shipping available. Buy with confidence, excellent customer service! 2018-07-18. New. Ships with Tracking Number! INTERNATIONAL WORLDWIDE Shipping available. Buy with confidence, excellent customer service! 1998-05-08. New. Ships with Tracking Number! INTERNATIONAL WORLDWIDE Shipping available. Buy with confidence, excellent customer service! 2018-07-18. Good. Ships with Tracking Number! INTERNATIONAL WORLDWIDE Shipping available. May not contain Access Codes or Supplements. May be ex-library. Shipping & Handling by region. Buy with confidence, excellent customer service! Harpercollins, 1967-06-01. Hardcover. Very Good. Author signed (not inscribed) half title page stated first edition, tight and unmarked in lightly shelf worn price intact jacket. Please email for photos. Alfred A. Knopf, 1924. First Edition. Good to Very Good condition. Bookplate. BURFORD BOOKS @. Used - Good. Good condition. Good dust jacket. Published in 1967. BURFORD BOOKS @. Used - Very Good. Very Good condition. Good dust jacket. 2003-05-05. Good. Ships with Tracking Number! INTERNATIONAL WORLDWIDE Shipping available. May not contain Access Codes or Supplements. May be ex-library. Shipping & Handling by region. Buy with confidence, excellent customer service! Pocket. PAPERBACK. 0671770071 New Condition. . New. Harper & Row. Hardcover. B000FBUAX6 New Condition. . New. Pocket. MASS MARKET PAPERBACK. B003GZ5YN4 New Condition. . New. Burford Books. PAPERBACK. 1580800599 New Condition. . New. 1998-05-08. Good. Ships with Tracking Number! INTERNATIONAL WORLDWIDE Shipping available. May not contain Access Codes or Supplements. May be ex-library. Shipping & Handling by region. Buy with confidence, excellent customer service! London, UK: Hamish Hamilton Ltd., 1968. First Edition. Hardcover. Very Good/Fine. Size=5.5"x9.". 28 B/W Photos, 2 Endmaps. (full book description) Hamish Hamilton Ltd., London, UK, 1968. 1st UK Edition VG+/Near Fine, Hard Cover, w/Dust Jacket. Size=5.5"x9. ", 331pgs(Index). 28 B/W Photos, 2 Endmaps. Owner bookplate, ink owner name/date on 2 pages after front endpapers, o.w. clean. tight and bright. Rest of book in Fine Like N ew condition. Price unclipped. [WWII-Pacific; Military History; Naval Warfare; World War II; Battle of Midway; Second World War] SELLING WORLDWIDE SINCE 1987. WE ALWAYS PACK WITH GREAT CARE! 1993-09-06. Good. Ships with Tracking Number! INTERNATIONAL WORLDWIDE Shipping available. May not contain Access Codes or Supplements. May be ex-library. Shipping & Handling by region. Buy with confidence, excellent customer service! Burford Books, 1998-03-17. Paperback. Used:Good. New York: Harper & Row, 1967. 1st Printing. Hard Cover. Very Good/DJ Very Good (price clipped). Octavo. Pocket. Mass Market Paperback. B003GZ5YN4 . Fine. 1968-01-01. 1st Printing. Book. Hardcover. 1967 BRIGHT FRESH CLEAN TIGHT 367 PAGE HARDCOVER WITH VERY GOOD JACKET THAT FEATURES ENDPAPER MAPS OF THE JAPANESE ADVANCE ACROSS THE PACIFIC! BETTER THAN A PAPERBACK. Pocket. MASS MARKET PAPERBACK. B003GZ5YN4 Like New Condition. . Fine. Harper & Row. Hardcover. B000FBUAX6 Like New Condition. . Fine. Burford Books. PAPERBACK. 1580800599 Like New Condition. . Fine. Pocket. PAPERBACK. 0671770071 Like New Condition. . Fine. New York: Harper & Row, 1967. First Edition. very good, good. 331, illus., endpaper maps, index, DJ slightly soiled and small tears. Burford Books, Short Hills: 1967,. Hardcover with dustjacket. Good condition. ISBN: 1568658672. New York: Harper & Row, 1967. Large Type Edition. good. Quarto, 331, illus., maps, index, boards somewhat scuffed, some wear to top and bottom edges of spine. New York, NY: Harper & Row, 1967. 1st Ed. Hardbound. 8vo. 331 Pgs.. Fine in Chipped DJ/Good. 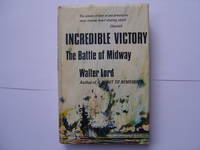 Incredible Victory by Walter Lord. Published by Harper & Row, New York, NY, 1967. 1st Edition. Hardbound, Paper DJ. Size 8vo (up to 9-1/2'' tall). Condition: Fine in Chipped DJ. 331 Pgs. LCCN 67-13687. Battle of Midway. Illustrated with black and white photos. Description text copyright 2000 www.BooksForComfort.com. Item ID 983. Harper & Row, Publishers, 1967. Hardcover. Very Good/Very Good. New York: Harper & Row, Publishers, 1967. Book club edition. Hardcover. 331 pp. Very good, in a very good price clipped jacket. Book has bumped spine ends and corners on the rear board. Jacket has a touch of edge wear, toned edges, scratches, and bumped spine ends. Spine has small damp stains. Rear panel has creases. Good for age in somewhat chipped, bumped and marked dustjacket. Price clipped and replaced with publisher's price sticker. New York: Pocket, 1968. Softcover. Very Good. First edition. Very good in wrappers, a paperback. Pages browned. Corners rubbed. 2856. Please Note: This book has been transferred to Between the Covers from another database and might not be described to our usual standards. Please inquire for more detailed condition information. Harper First edition. Nice copy in good dj (no rips, chips or tears). Previous owner's stamp on first half page. Author is the man who also wrote the best-selling "A Night to Remember" about the sinking of the Titanic..
1 . hardback. Fine. Illustrated. 1st ed. NY (Harper & Row) 1967. Fine in dust wrapper. Small shelfmark inside. Harper & Row. Collectible - Good. First edition copy. Collectible - Good. Good dust jacket. Slightly dampstained. NY: Harper & Row, 1967. Book. Very Good. Hardcover. Description of the Battle of Midway, 4 June 1942. 331pp, illustrated. Very Good. London, Hamish Hamiliton, (1968).. 8vo; pp. xv, 331; endpaper maps, frontispiece, 28 pages of plates, acknowledgments, list of contributors, index; chipped dustjacket, a good copy. N.Y., Harper & Row . Hard Cover. 331 p., index, endpaper maps. The June 1942 naval victory of the United States Navy over an enormous Japanese fleet at the Battle of Midway in the central Pacific changed the course of World War II. This was written on the basis of hundreds of interviews and before knowledge of 'Magic'-- American reading of Japanese codes-- was unclassified. Stock #27113. Vg/ price clipped dj vg. World War II, naval operations, naval aviation, Japan, United States military history. Pocket Books, 1968. 1st Printing. Mass Market Paperback. Fine.